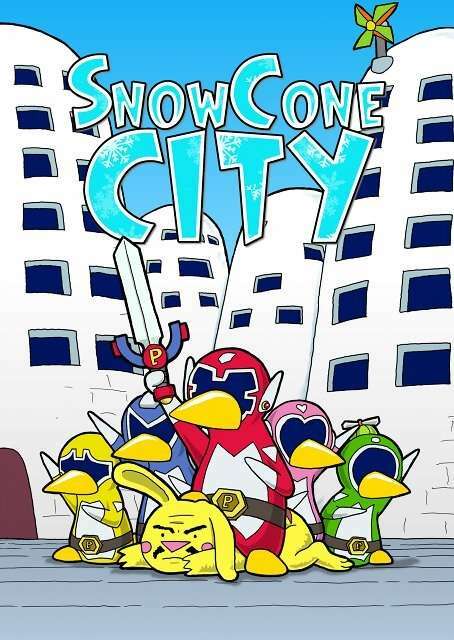 SnowCone City Episode 1: Penguin Rangers vs the Pet Monsters, written and drawn by Joseph Hewitt and published by Polar Bear Comix, takes the task of spoofing the already outrageous, mid-afternoon entertainment, Power Rangers and Pokémon. Both Power Rangers and Pokémon were Japanese imports that saw the apex of their American popularity in the 1990s but SnowCone City may be the first time both of these shows have been spoofed as adversaries facing off against each other in a comic book. SnowCone City is a nutty, tongue in cheek poke at culturally unique franchises and feels a little bit like a Mel Brooks comedy. Giving Pokémon a devilish black mustache, eyebrows and a brilliant plan to free his fellow monsters from the planet Kormac, Hewitt’s writing seems to say that nothing is too silly for SnowCone City. His Power Penguins, literally posing for the cameras and taking the fight to the otherworldly monsters also shows that Hewitt not only knows his material but he holds it in a kind of campy high regard. Hewitt’s writing revels in his extreme melding of the Power Rangers and Pokémon. Hewitt’s love for his own version of the Power Rangers and Pokémon in his SnowCone City can also be seen in the way that he draws these characters in an extremely cartoony and efficient grey-scale way. At the same time that his writing takes these already over the top characters even further, his art makes them come alive in an appropriately absurd way and his panel to panel storytelling is a lot of fun. The only thing about this book that is more cracked than the general concept is the finale that resurrects and caricatures another great monster, Cthulu. This entry was posted in Columns and tagged alternative comics, buy indie comics, cthulu, Joseph Hewitt, Pokémon, polar bear comix, power rangers, self-published comics, SnowCone City. Bookmark the permalink. Follow any comments here with the RSS feed for this post. Post a comment or leave a trackback: Trackback URL.